Paul Savage and Associates have been providing high quality podiatric care in Sunderland for over 30 years. We aim to provide a personalised service to each and every patient. We are specialists in advanced podiatric treatments including nail surgery, biomechanical assessment, and verrucae removal. We also provide routine chiropody and footcare services. There is easy, free parking with Blue Badge spaces immediately outside and ramped access into the surgery. We are fully registered with the Health and Care Professions Council. Have you been referred by your GP? Click here. 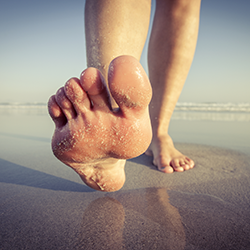 For more information on our private podiatry services please click here. As part of North East Podiatry, Paul Savage and Associates are also a provider of community podiatry services on behalf of the NHS. For information on these services click here.